Falcon Industry prides itself on producing robust tools that exceed our customers' expectations. We excel in the design, build and tryout of progressive dies up to 220" in length. Over the past ten years Falcon Industry has built many cold drawn reduction extrusion dies for several stamping companies. This offers cost saving opportunities to the OEMs through the elimination of weld nuts. 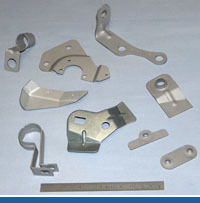 We also have experience in all types of brackets, clips, clamps, reinforcements, speaker grills, heat shields, inner panels and all the varying stamped parts used in automotive assemblies. Our state of the art facility has all the capabilities to completely design, build and tryout all projects in house. We utilize CAD/CAM technology to interface with our Wire EDM, CNC Mill and CMM machines to produce high quality dies that our customers have come to expect. Our 120" x 60" bed press is equipped with a decoiler, straightener and feeder which allow us to prove out all our tools in a simulated production environment. We understand the importance of our customers' manufacturing schedule and work to minimize any home line tryout or down time. We provide quality tooling, built to exacting customer specifications, manufactured on time with the robustness to produce millions of pieces over many years of production.